Hey there Big Boy, our Old Amos, you have now joined our other Mastiffs who have passed to the other side. 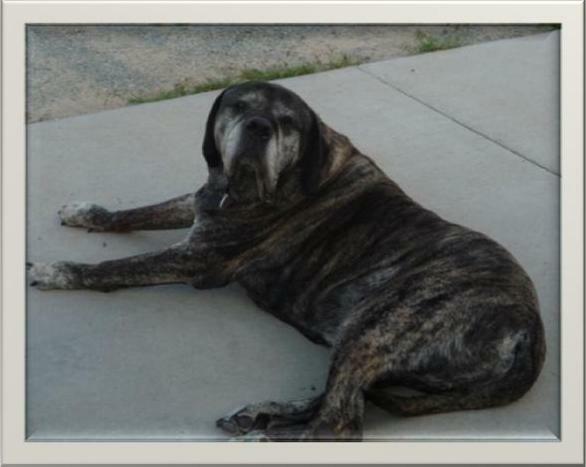 You now have the status of our oldest Mastiff. You came to us as our first kennel resident in 2004. You had such a tough time, we felt so bad for you. We received a call from our friend in Sacramento, Deb Golden, who indicated that your beloved human companion passed away suddenly whom you were very attached and loved. The family evidently didn’t share the same love for you and they placed you in the shelter system. You poor baby, so upset that you were labeled “aggressive”. A home was found for you but unfortunately they didn’t understand the trauma and grief that you were experiencing, so they too were planning to euthanize you. Deb saw in your eyes, the gentleness, the love and she rescued you and then contacted us. We waited until the kennel opened in September, 2004 and voila you became our first official resident. The adjustment was so very hard for you but slowly and over time, you warmed up to us and the staff, enjoyed walks in the desert and you certainly enjoyed the freshly baked chicken every day. Eventually, we integrated you into our home with our beautiful Honey Bear. We had no idea how this would work with two big males, both neutered. As it turned out and to our surprise, you absolutely adored Honey Bear following him around the house step after step, unbelievable! Honey Bear thought you were cool and you became the best of friends. When Honey Bear passed in 2007, you were lost without him, but started following your sisters around, they were far less tolerant. You were so brave living with multiple disabilities that slowly were crippling you but you maintained that beautiful stoic nature that our Mastiffs display. We effectively managed pain with our Vet colleagues’ help; in fact your days were plentiful and full of love. You are now with the other Mastiffs and I’m sure you are now following Honey Bear around step by step as you always had here on this side. We miss you big boy, your sisters miss you. God speed in your journey and we were so happy we had the chance to be with you for these years. Love you.